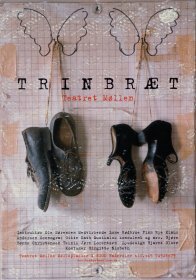 A selection of posters, mostly for the theater, from 1982 - 2006, with texts by Leif Hjernoe, Erik Meistrup, and comments by Gitte Kath about each poster, a list of posters, and a short biography. 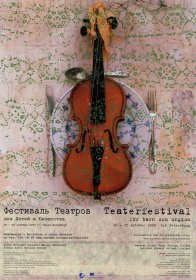 Gitte Kath is not only an internationally well known poster designer, but also a playwright, theater director, actor, and scenographer, sometimes all of that at the same time, and so she knows what she does when she makes a theater poster. 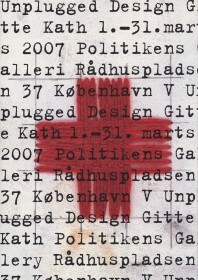 In fact, Erik Meistrup writes in the introduction of the book It is impossible to divide Gitte Kath's artistic work with posters from her work at, with, and for the local theatre, Teatret Mollen in Haderslev. 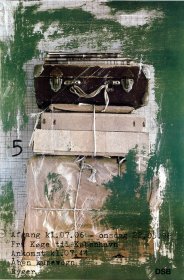 This work hasn't merely been a platform but a totally integrated part of her work and has left its mark in her personality and understanding of life and society. She is not limited to the theater, however, and says "may basic skills are children's theater and linen-weaving", and the cover of the book showing an envelope with a Red Cross stitched on it reminds us of her textile interests. 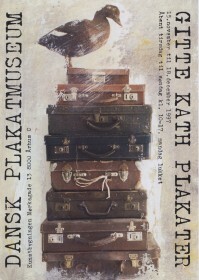 Another characteristic of her work is the use of simple everyday objects, like suitcases, her violin, shoes, or clothing. An ordinary old fashioned typewriter seems to be her main or only typographic tool. All of this is a reflection of her life philosophy of "cutting down and cutting out, daring to do without, and from almost nothing managing to tell it all."